Is growing your business in 2018 top of your to-do list? Here are our top tips to help you achieve your goal. Nurturing your customers is more than simply offering them great service. Take the time to get to know them and their needs, and figure out ways to meet those wants and needs. Customers respond well to bespoke service that makes them feel well looked after. Introduce a loyalty program to reward VIP customers for their loyalty. Provide special offers, discounts or promo codes to customers who have been inactive for a while. Ask for feedback from customers to help improve your offering. This can be done at point of sale or via email. You might even want to incentivise this by giving customers the chance to go into the draw to win a prize for completing a survey. Social media: Build an online community around your business by providing your current and potential customers with engaging, helpful content. Advertise the ‘big wins’ of your business, like industry awards. Post photos of staff events to show the human side of your business—this will make customers feel more connected with your business. Giving back: Building brand awareness in your local community is a great way to attract new business. There are lots of local community groups and sporting teams that are often on the look out for sponsors, so give back where you can. Networking: Networking events can help you build relationships and in turn, build your potential client base. Pages like Meetup are great for finding networking events near you. Having the right team of people in your business is important. Especially in a small business where you’re often working closely together, hiring the right people and developing them can be a game changer to helping your business grow. Screen applicants: Time is valuable, so before meeting with a candidate consider a phone call. If that goes well, then meet with them in person, this will give you a better feel for how they’ll fit into your organisation. Consider culture: You want your new hire to fit into the environment you have, but it’s also worth staying open to someone bringing a different dynamic into your team too. Schedule frequent reviews to determine what staff want to get out of their job. Growing your business can be a challenge, but with the right team and support systems in place you’ll be in a good position to create more success in 2018. How are you planning to grow your business this year? Do you need help to make it happen? Find out how Deputy can make your life easier so you can get you back to loving your business again. Get in touch with our friendly team today on 1300 DEPUTY. The post Dream big and grow your business in 2018 appeared first on Deputy. Approximately 4.5 million low wage workers in 18 states saw an increase in their paychecks beginning New Year’s Day, 2018, as wage hikes took effect. These states already had rates above the federal floor of $7.25 an hour. A HuffPost YouGov poll last year found that more than half of all Americans thought a minimum wage raise would be good for workers, while only a third thought it would be a bad idea. The current federal minimum wage is $7.25 per hour and has not increased since July 2009. When the state, city or county minimum wage rate is higher than the federal rate, employers are required to pay workers the higher amount. The debate around the federal floor is becoming more and more academic since not many Americans work for $7.25 an hour these days. According to the Washington Post, in 2016, just 2.7 percent of the country’s 79.9 million hourly workers earned that amount. The U.S. Department of Labor says 70 percent of companies are not compliant with wage and labor laws! It’s critical for U.S. businesses to be compliant with labor laws as the Department Of Labor regulatory enforcement and lawsuit spending is on the rise. Software and technology can help comply with these new wage and overtime rules through accurate employee tracking and reporting. As an industry leader in workforce management and attendance tracking, Deputy has multiple solutions, including automated attendance recording, performance management, payroll & POS integrations, accurate location and time tracking, communication features, biometric face recognition, and custom reporting. Choosing the right workforce management technology can protect companies from fraud to major lawsuits. By using Deputy’s cloud-based technology, businesses can easily manage their employees, adhere to compliance, and grow their bottom lines. Take action today and join over 40,000 business by signing up with Deputy. For more information about minimum wages across the country, visit epi.org. The post List of U.S minimum wage increases in 2018 appeared first on Deputy. 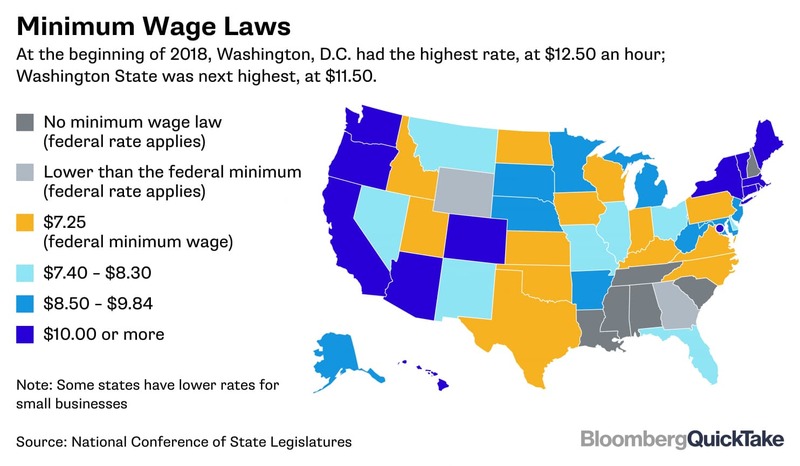 As we enter 2018, increases in the minimum wage laws in the United States have become a hot topic. Approximately 4.5 million low wage workers in 18 states saw an increase in their paychecks beginning New Year’s Day, 2018, as these wage hikes took effect. These states already had rates above the federal floor of $7.25 an hour.